Take advantage of the late winter window to get your garden ready for an even more glorious spring. It's best to wait until spring has made its full arrival before plunking tender seedlings in the ground, but there's still plenty of prep to start now. You may soon find yourself in a similar boat, itching to get outside and start planting. But it’s best to wait until spring has made its full arrival before plunking tender seedlings in the ground. That doesn’t mean there’s not plenty of prep to start now, though. Here’s how to take advantage of the late winter window to get your garden in order for a glorious spring. When the ground’s still frozen or too soggy to mess with, take stock of your tools and equipment, and take care of any needed maintenance. Repair and restore digging tools:Break the handle on a shovel or digging fork last year? If it’s a good quality tool, it’s worth buying a new handle and replacing it rather than tossing the whole thing in the landfill. Some gardeners go so far as to sharpen the digging blade of their shovels with a coarse file each year, but at the very least it’s nice to wash off any accumulated dirt, dry down the blade, and spray it with penetrating oil to ward off rust. Winter has a way of leaving the yard looking more than a little disheveled – sticks and debris scattered about and tattered, half-dead vegetation everywhere – so it’s high time for a bit of grooming. Give those spring flowers the backdrop they deserve! Rake and restore:Collect leaf litter and add it to your compost pile or stash to use as mulch when the summer heat hits. Bag up sticks and run them through a chipper (if you have access to one) to make mulch, or put them on the curb for municipal pick up. Rake up your beds and add the old mulch to the compost pile. Spread a ½-inch layer of finished compost over the bare soil to replace lost nutrients. Primp and prune:Pull out fall annuals that died over the winter and toss them in the compost pile. Unwrap burlap coverings from evergreen shrubs and trim off and winter dieback (i.e. leaves and branches that have turned brown). Any perennials and ornamental grasses that weren’t cut back in fall should be chopped down to about 4-inches tall to prepare for new growth. Saw off broken branches back to the larger branch they’re attached to, leaving a smooth cut rather than a little stub. Prune ornamental trees, shrubs, and vines to remove dead wood, control their size and to enhance flowering and overall appearance. If you didn’t get to it over the winter, now is the last chance to prune fruit trees, grapevines and other food plants. Extra touches: Sculpt your flower beds with an edging tool to maintain clean, crisp lines and keep lawn grass from invading. Divide clumping perennials (things that grow from bulbs, tubers, corms, and rhizomes – dahlias, hostas, lilies, and comfrey are but a few examples) to give the roots more space to grow and use the divisions to fill in bare areas in the yard. Cut branches of early spring blooms (forsythia, redbud, magnolia, etc) and “force” them in a vase indoors for a late winter flower arrangement. Once the soil in your vegetable garden is dry enough to not squish when you step on it, it’s time to start laying the groundwork for spring planting. Clean out:Remove any leftover veggies that didn’t survive the winter and toss them into the compost pile. Pull out drip irrigation tubes to make way for tilling and planting. If you planted cover crops in the fall, mow them to the ground and then let the stems dry out for a couple weeks before tilling in the debris. If you mulched your beds in fall, rake off the mulch and add it to the compost pile. Top up the fertility: Spread 1-2 inches of fresh compost on your beds. Add supplementary nutrients like lime (for acidic soils), sulfur (for basic soils), bone meal (for phosphorus), greensand (for potassium), and kelp meal (for micronutrients). Till in the compost and amendments, but only once the soil is dry enough to crumble when you grab a handful – then rake the beds into smooth, ready-to-plant mounds. Consider getting a soil testto fine-tune your fertility management strategy. 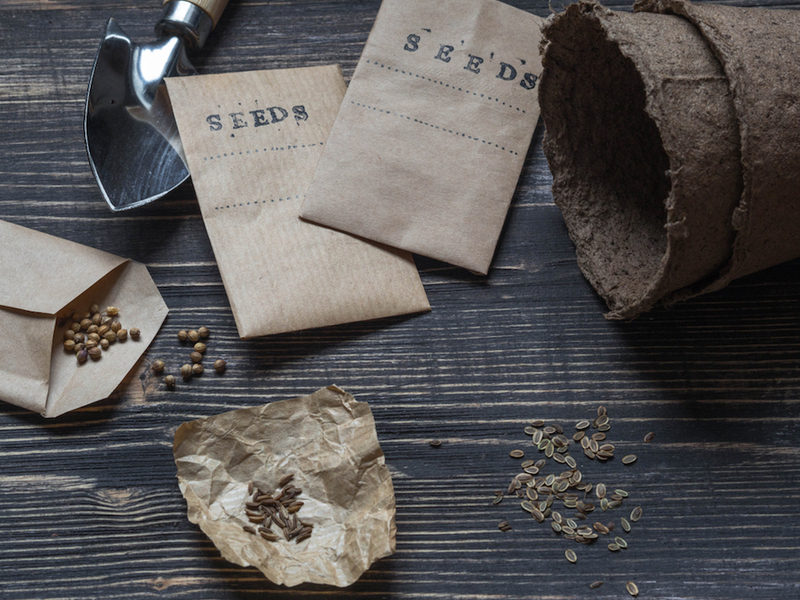 Sort your seeds: If you haven’t picked out seeds and gotten some started indoors, now is the time!